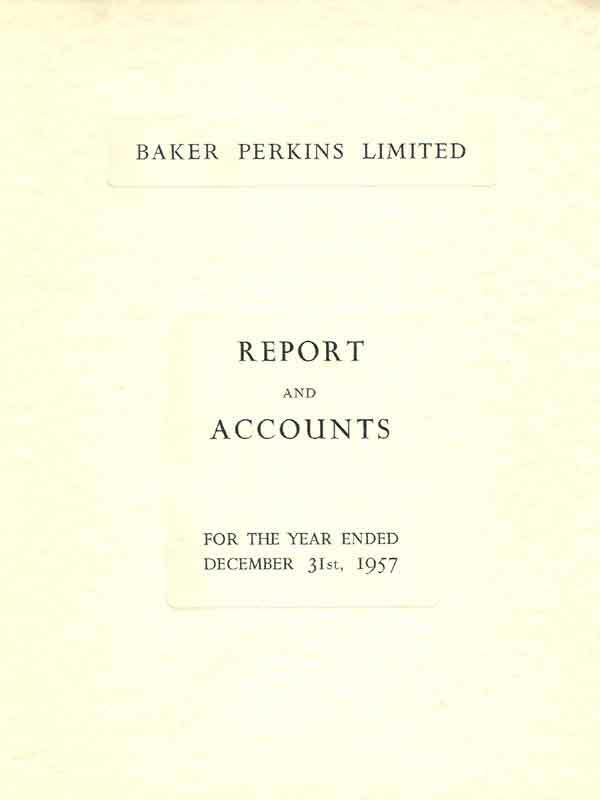 We have been fortunate in locating copies of Annual Reports from the beginning of the 20th century for the 'Baker' side of the business. 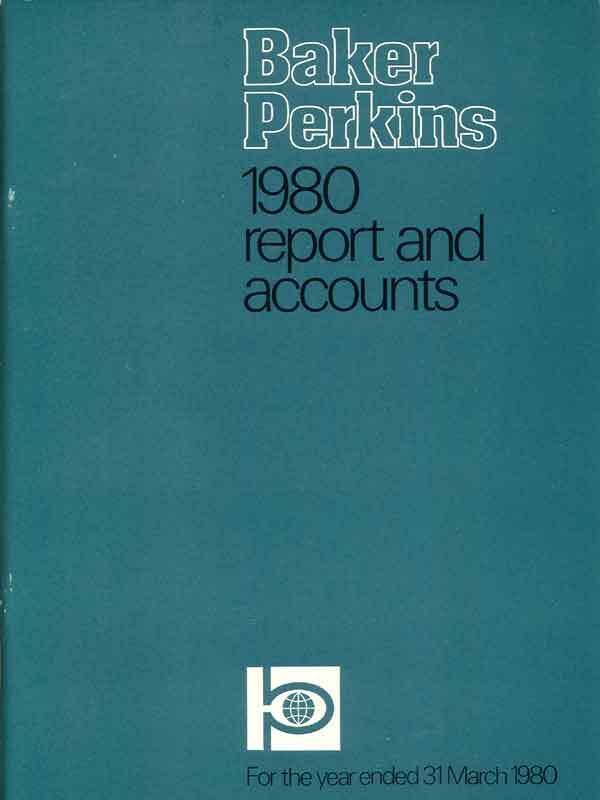 However, no Annual Reports for the 'Perkins' side prior to the 1919 merger have yet been found. We first analyse what the Annual Reports indicate about the changes in the nature of the business over time in Business Development, before looking at how the fortunes of the company were reported to the outside world in The Directors' Statements. Finally, the way in which both the form and content of the Company's Annual Report changed dramatically over 100 years is described. BUSINESS DEVELOPMENT - Growth through good and bad times. 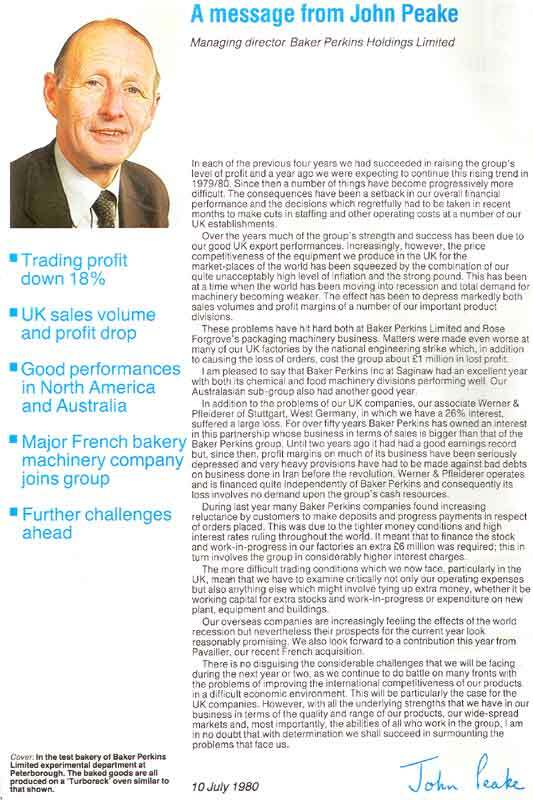 SNAPSHOT - What sort of company was Baker Perkins? Company Annual Reports give some insight into the state of a company and of its development over the years. Statutory Regulations might ensure, at least to some extent, the veracity of the financial statements but a degree of scepticism can be called for when interpreting some of the written statements, particularly about the business opportunities that existed and the capabilities of the organisation to benefit from them. However, as an insight into the strategic thinking of the management over time they provide a useful resource. 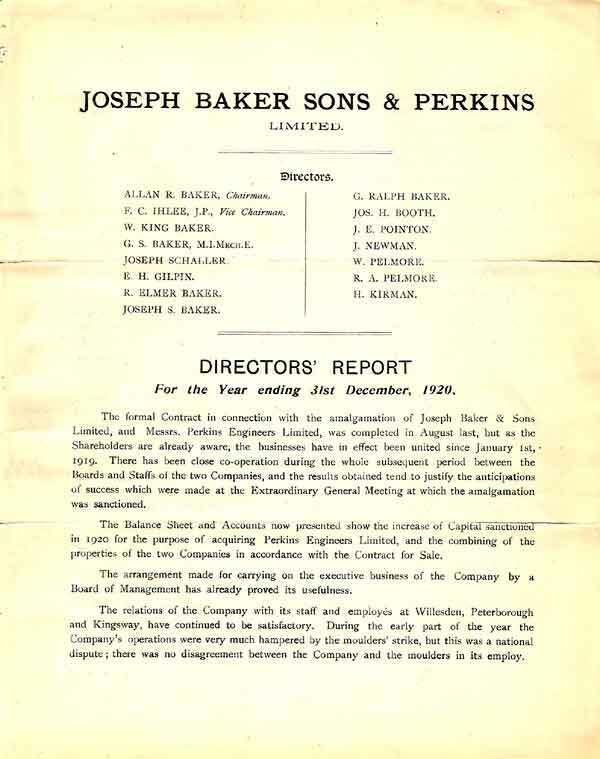 Joseph Baker & Sons became a Limited Liability Company in 1902 and copies of its Annual Reports are available from 1903. 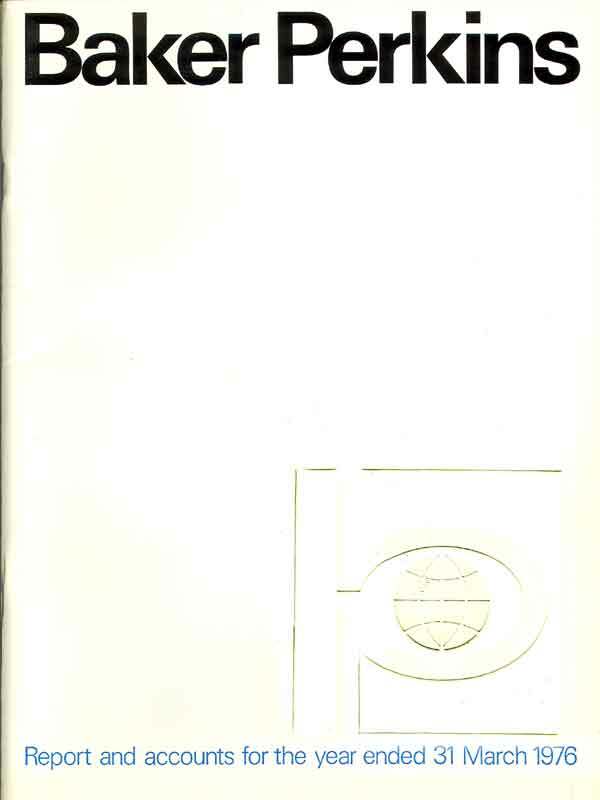 No copies of Annual Reports for Werner Pfleiderer & Perkins Ltd. or Perkins Engineers Ltd. prior to the merger with Joseph Baker & Sons in 1919 have yet been located. 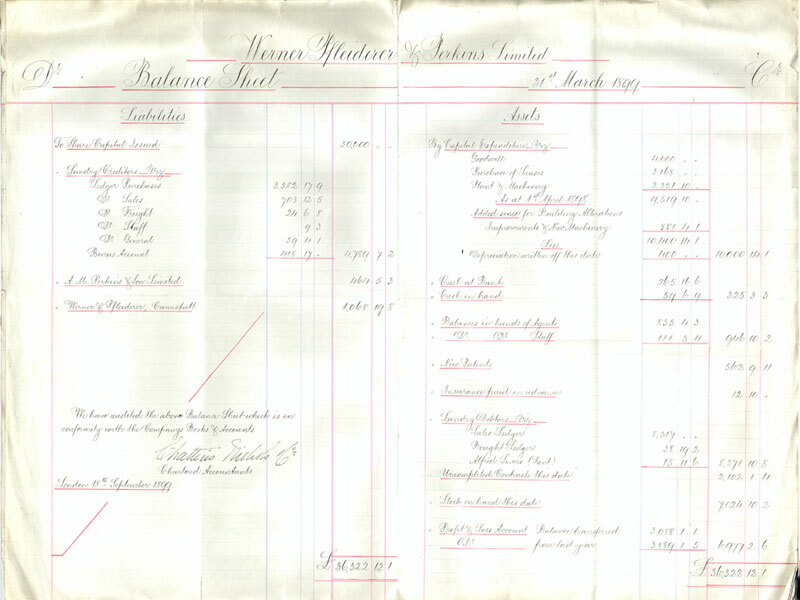 We do, however have an 1899 Balance Sheet for Werner Pfleiderer & Perkins and this is shown below. This is remarkable less for the financial results than for the beauty of the calligraphy. Over the years the Annual Report changed from something that merely met statutory obligations to an attempt to influence the image of the Company within the financial markets. 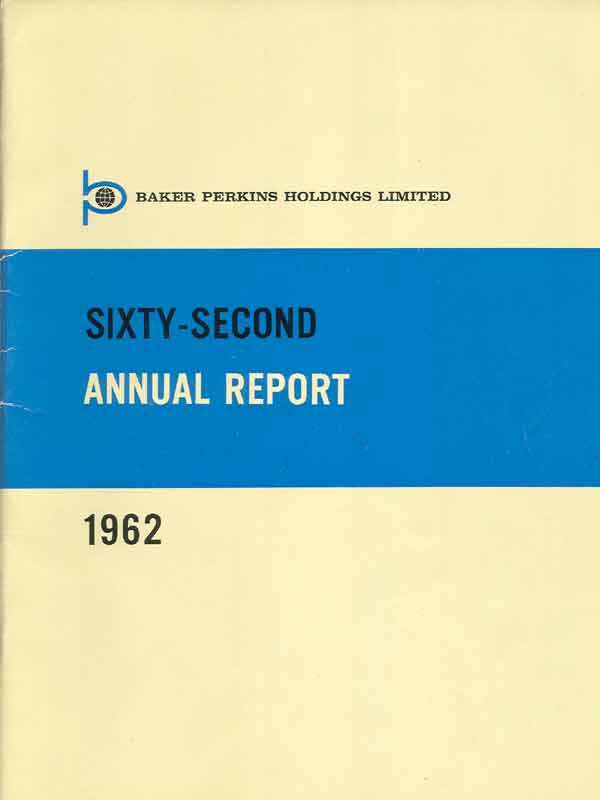 A very significant change in the quantity and scope of information, particularly financial data, provided in the Annual Report occurred after 1957 when the company's shares were first quoted on the Stock Exchange. 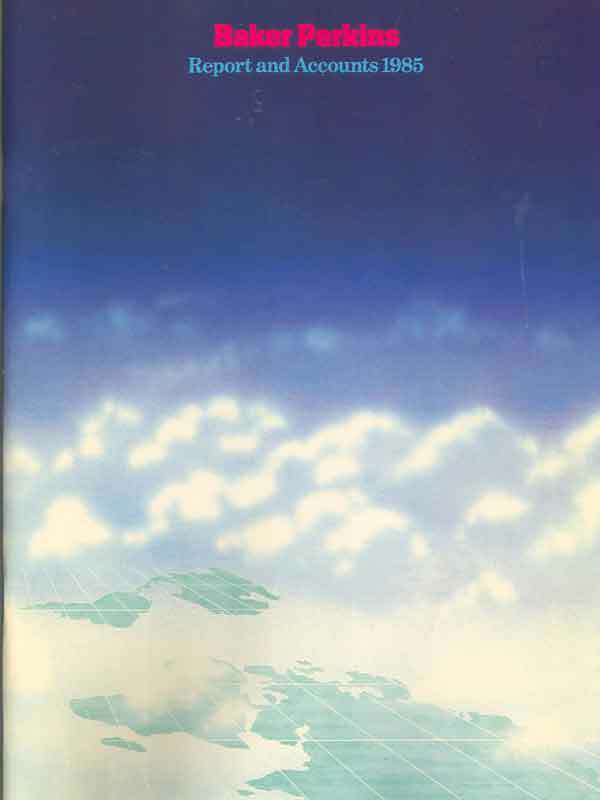 This content increased over the years, as did the cost of its production. However, alongside this, the management continued in its determination to communicate effectively with its workforce by including a review of the company's results in the Group Newspapers, this leading to the introduction of a separate section - "Financial Contact" - in which graphics were used effectively to explain the detail of the previous year's financial performance. (See below and also Group Newspapers). 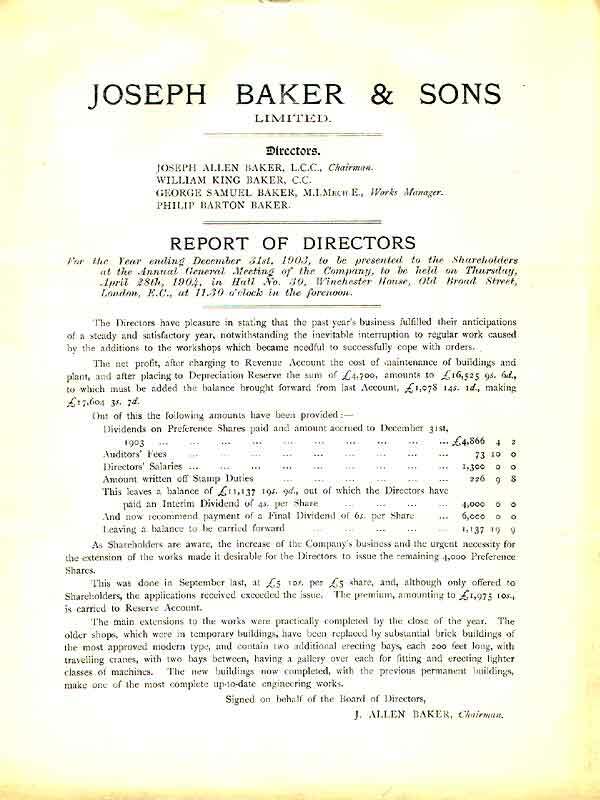 In 1903, the Annual Report was a fairly brief 4-page document with only a very few paragraphs describing the company's performance in a "Report of the Directors" on the first page, followed by two pages of the Balance Sheet and Profit and Loss Account. The final page gave details of the date and venue of the AGM. This possibly reflected the minimum level of information required by law. There was little change in the format or content of the Annual Report over the next 15 years. 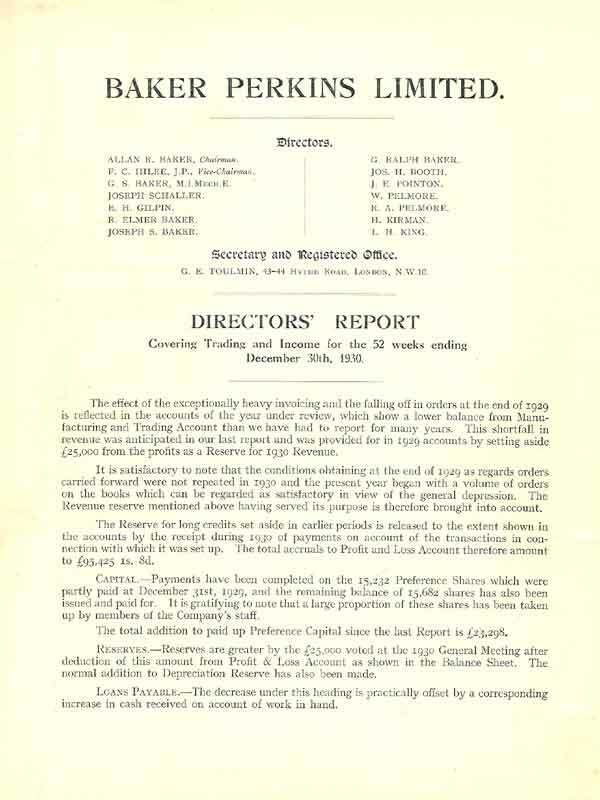 By 1919, the year of the Amalgamation, the Directors' Report had been extended to two and a half pages but the financials still covered only two pages. Over the next few years the Directors' Report grew to four pages, mainly to accommodate more information on the activities of the growing number of acquired companies and other investments. 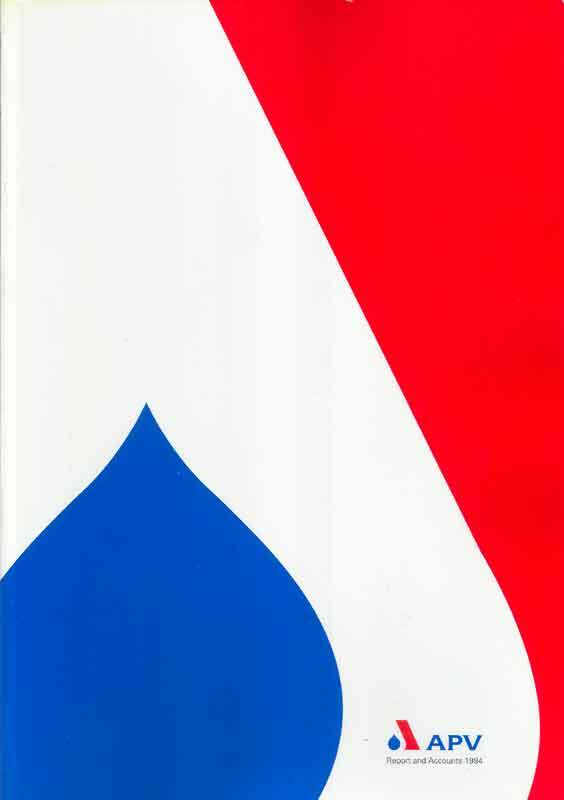 The Annual Report was still a rather plain, unpretentious document - in the War years it became even simpler - a single sheet of folded paper - until 1947 when it acquired a cover carrying the "Beaver" company logo. 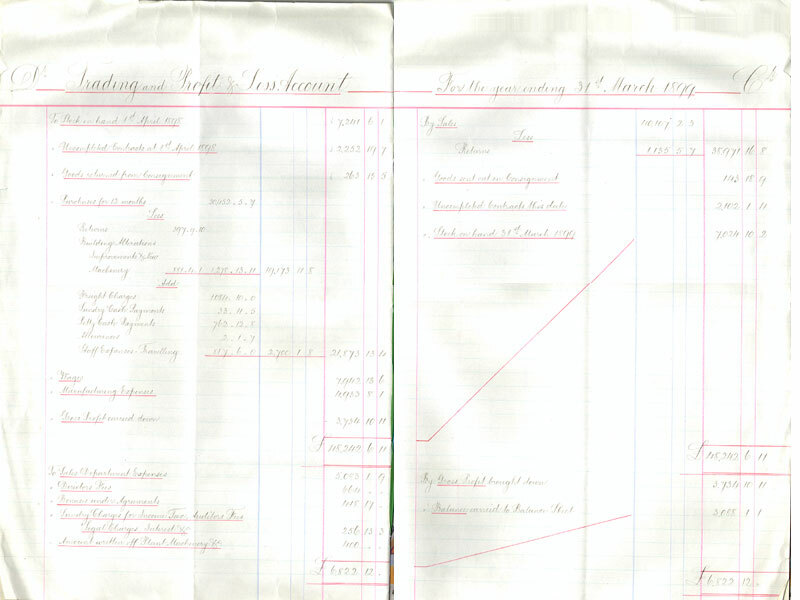 This format existed until 1957, the only change being to increase to eight pages the space devoted to financial results. 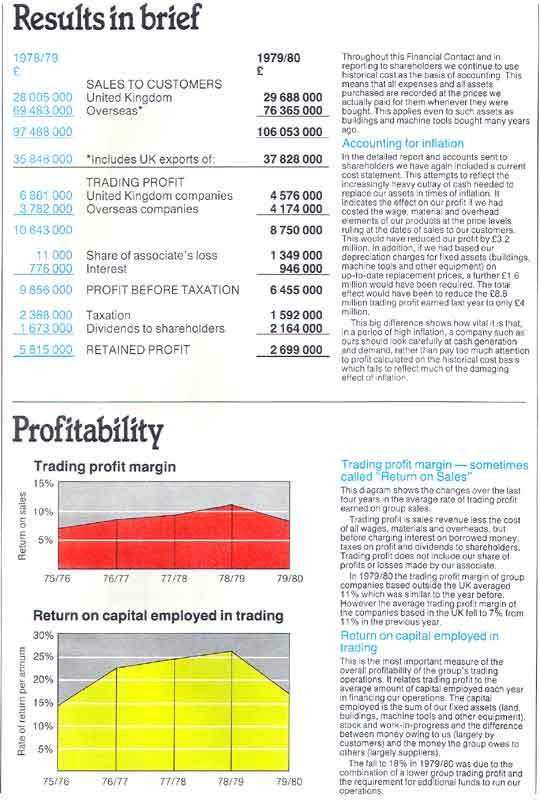 1957 was the year when permission for quotation of the ordinary stock on the London Stock Exchange was granted and the Company's performance came under wider scrutiny. A three page "Chairman's Review" now appeared at the end of the Report. 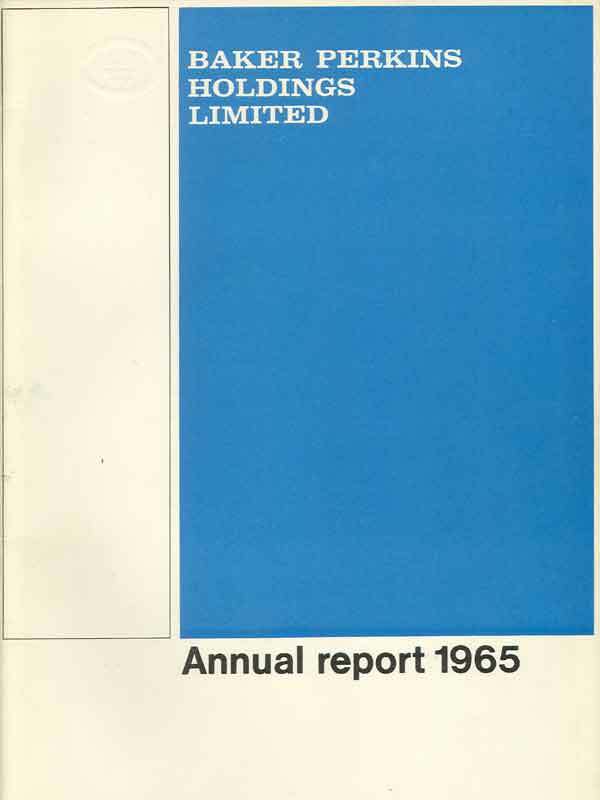 Inevitably, the amount of information, both business and financial, contained in the Annual Report increased significantly and by 1961, the Diamond Jubilee Anniversary Year, the Annual Report contained twenty pages of information. 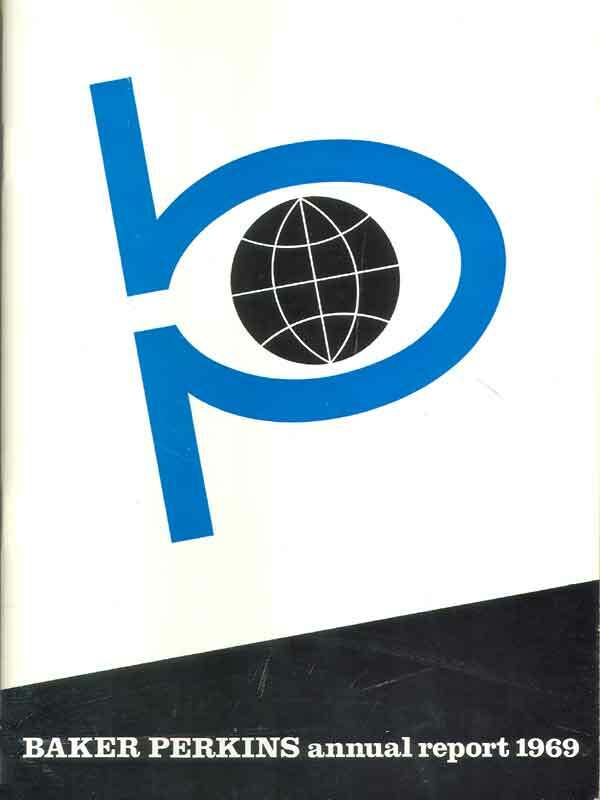 The first appearance of the "pregnant golf ball" logo came in 1962 following the formation of Baker Perkins Holdings Limited. 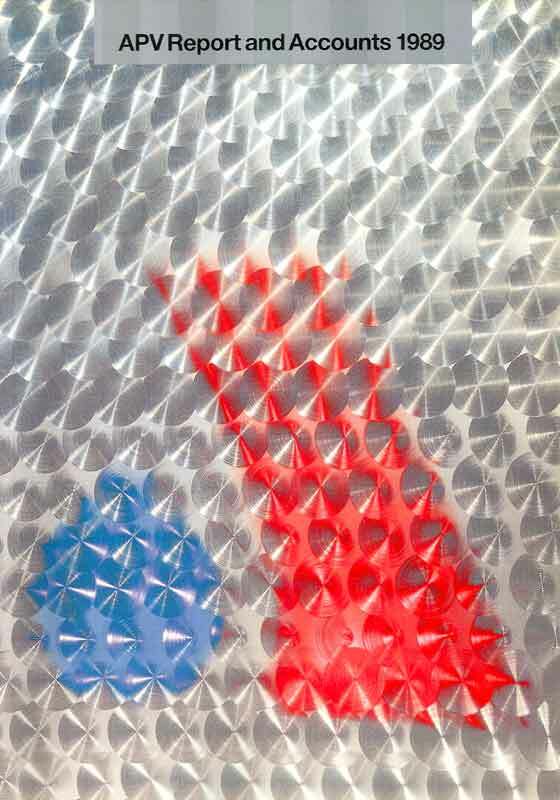 The Report contained a new departure - three pages of coloured product photographs. 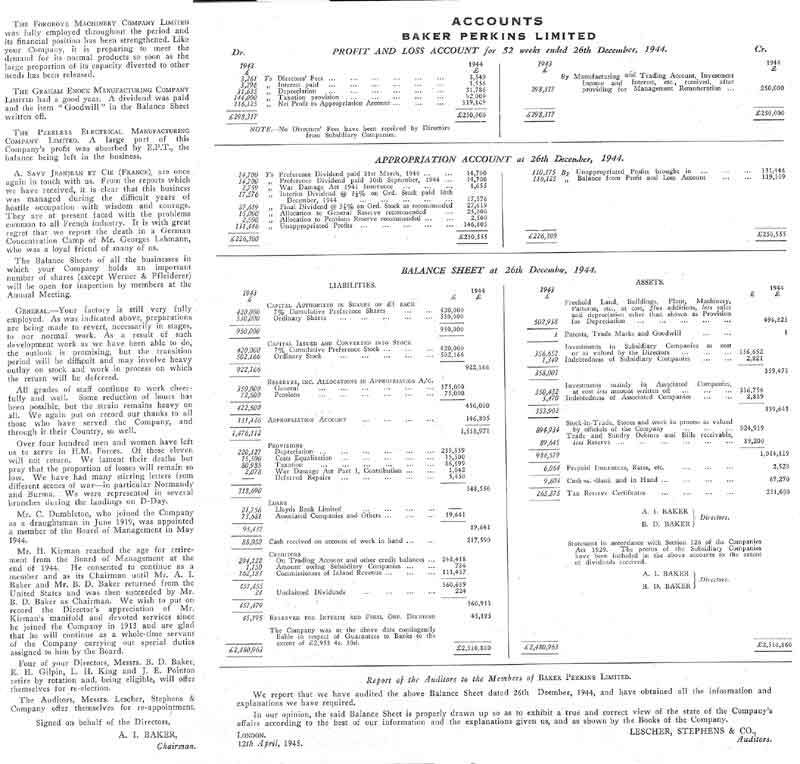 A Ten Year Financial Summary appeared for the first time in the 1963 A/R. 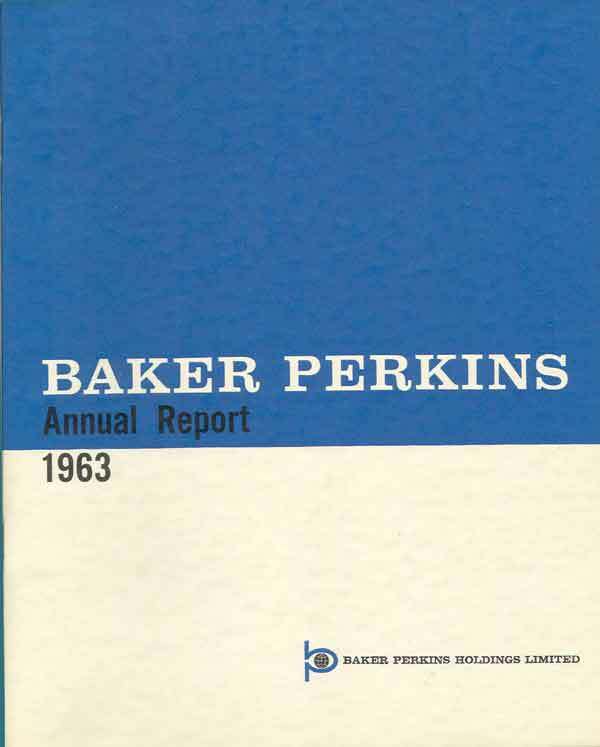 A change to A4 size occurred in 1965 and this cover, still featuring "Baker Perkins Holdings Limited" and the 'pregnant golf ball' was used until 1969. 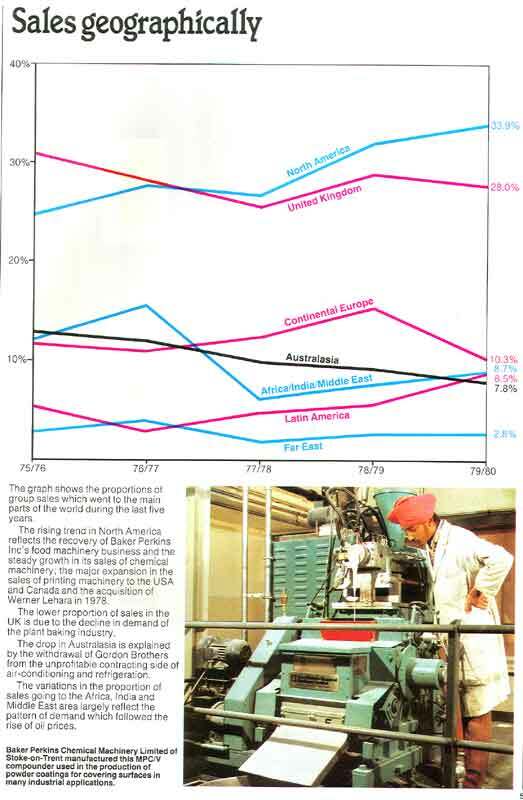 The 1967 edition contained a new feature - graphics (a pie-chart) - to explain how the group used its income. 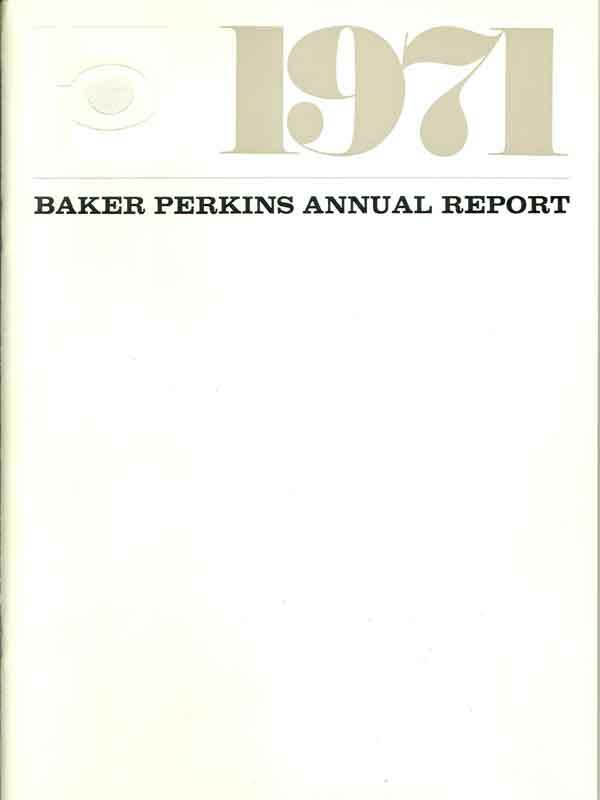 The cover of the 1969 Annual Report (and all subsequent issues) identified the Company as "Baker Perkins" although each page had "Baker Perkins Holdings Limited" as a sub-heading. 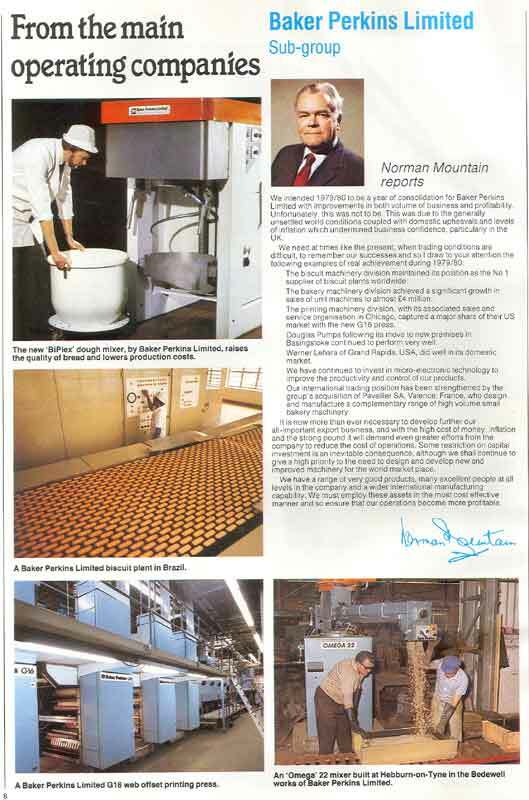 1970, the year of its publication, marked the 100th anniversary of the patenting of the simple domestic flour sifter by Joseph Baker, which laid the foundations of the company. (See also How it Started). 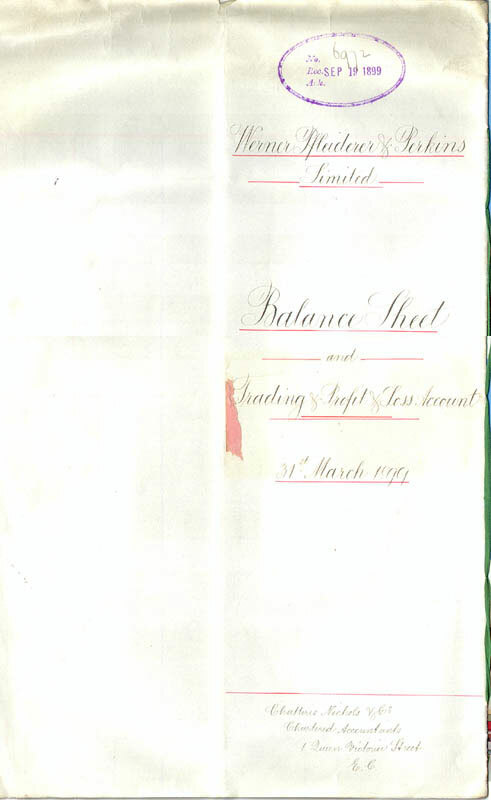 The document featured four pages of coloured photographs of products and an expansion of the financial details necessitated an increase to 32 pages. 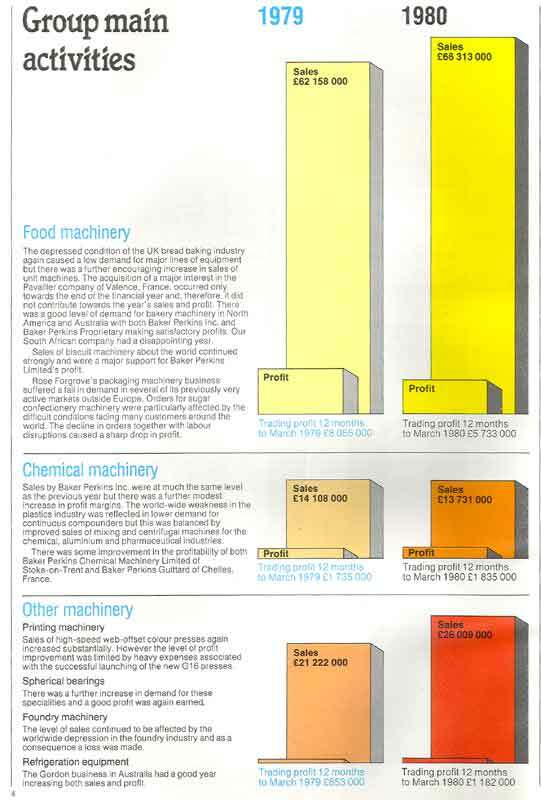 In 1970, the colour illustrations inside featured not only Baker Perkins machinery but these took second place to illustrations of the end products produced on that equipment. 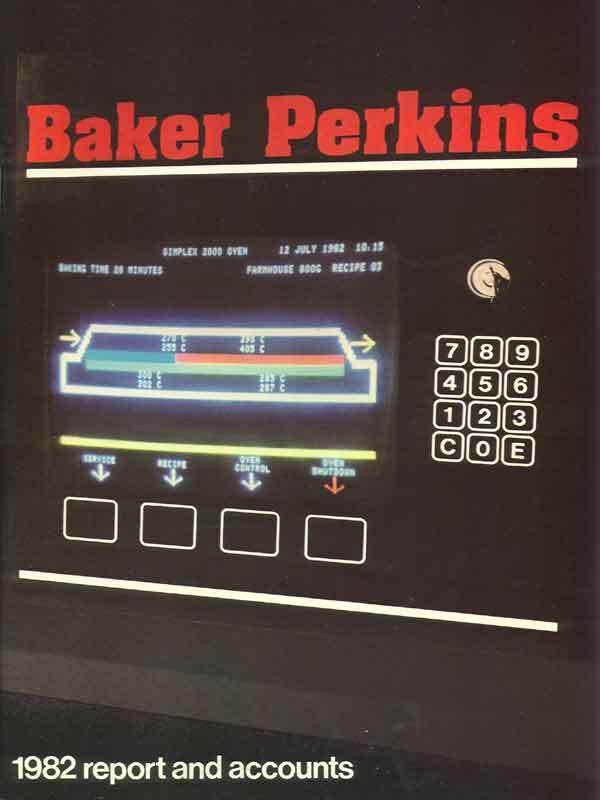 Perhaps surprisingly, although used later in the company's advertising literature, this obvious connection with the market place did not feature in subsequent Baker Perkins Annual Reports. By 1973, inflation in the UK was causing much concern. Cost was very much in mind, the director's report "is confined to the information required by statute" and the use of coloured photographs was discontinued. 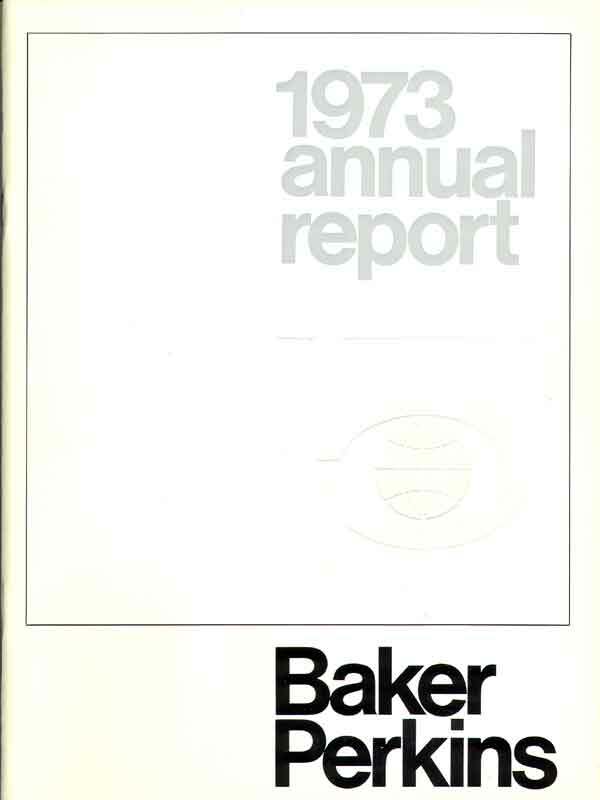 There was no Annual Report published in 1974. A decision was taken to change the financial year-end from 31st December to 31st March. 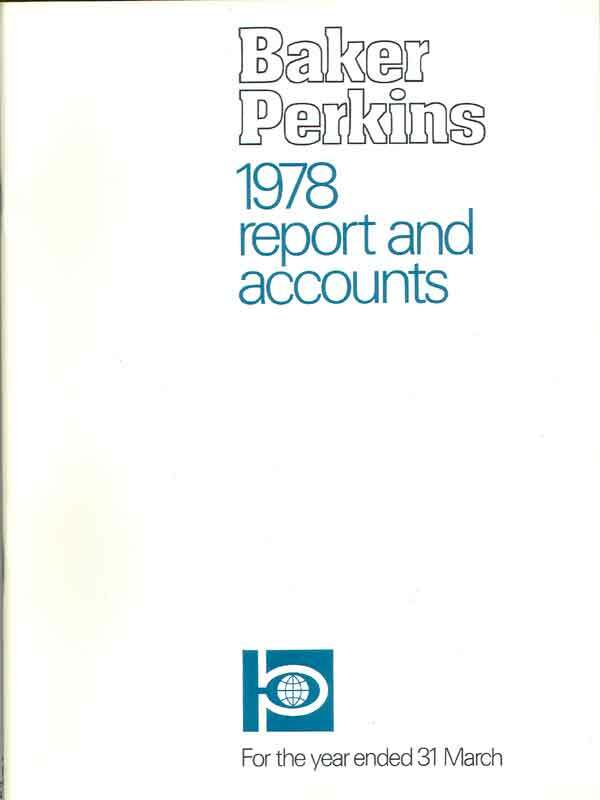 This was in part because – "In the past the publication of the annual report and accounts has had to be delayed longer than the directors wished to wait for the results of the important European Limited Partnership (Baker Perkins' investment holding in Werner & Pfleiderer GmbH) to be cleared by a general meeting of the partners." The next Report therefore covered the 15 months ended 31st March 1975. 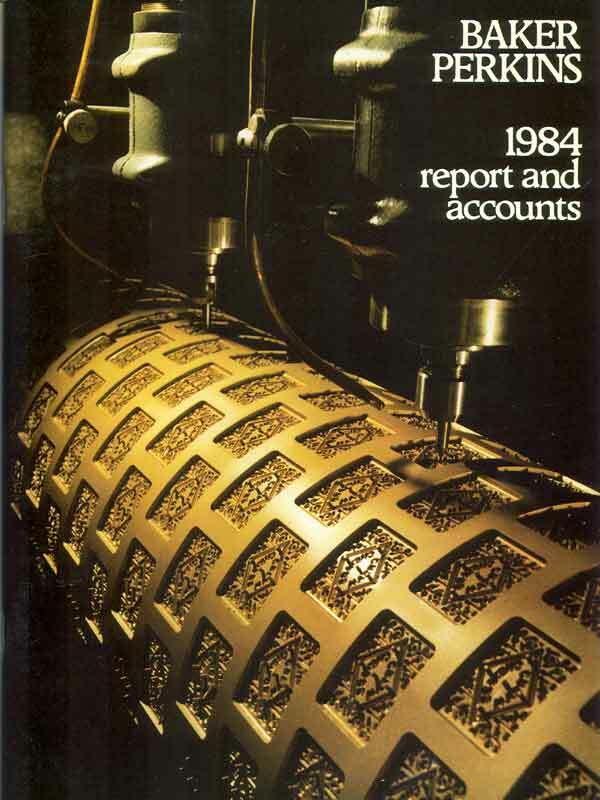 The style and content of the Annual Report remained constant throughout the difficult years of high inflation and 'pay restraint' of the mid- to late –'70s and the 1978 Report included a statement showing the inflation adjusted profit based on "the interim recommendations known as the 'Hyde Guidelines' issued by the Accounting Standards Committee." 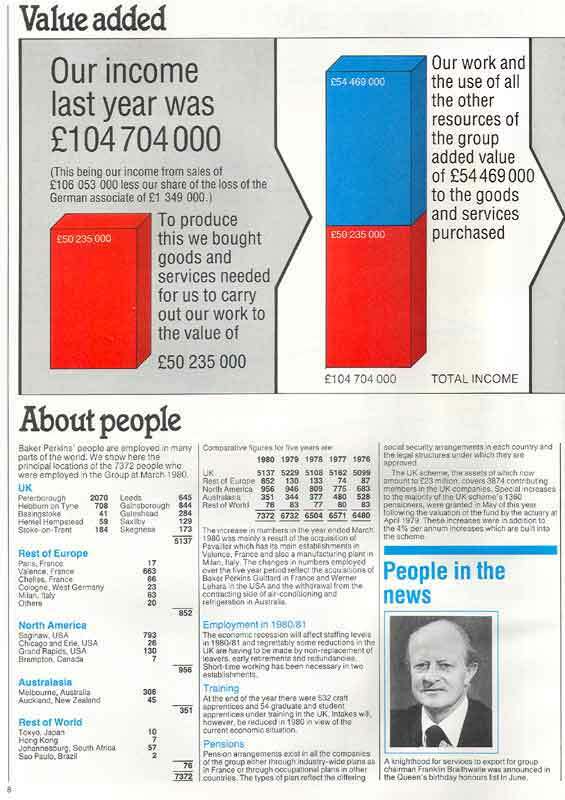 The only obvious change to the 1980 Annual Report was in the colour of the cover but by the next year, the continuing difficult economic times had had an effect on the quality of the paper used. 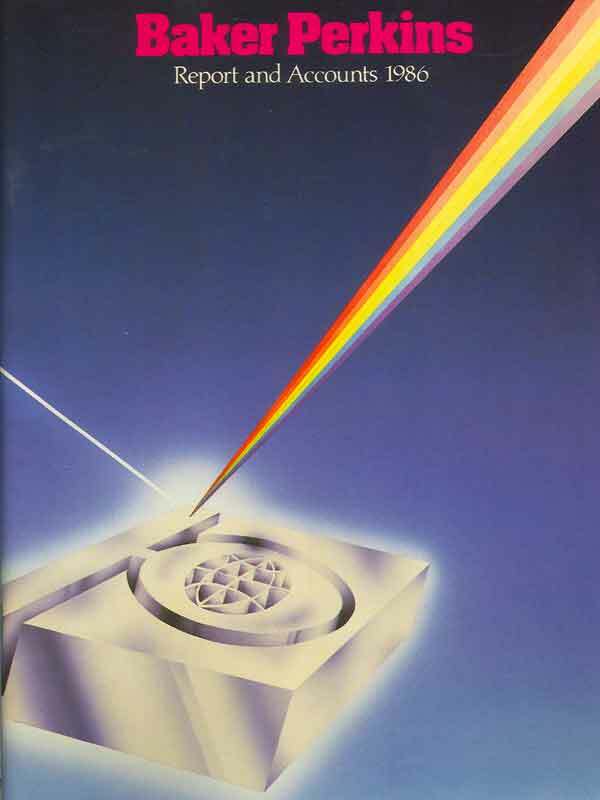 Profits were significantly increased in 1982 and this was reflected in a return to the use of higher quality paper and the first of a series of high-quality photographic images on the front and back covers. 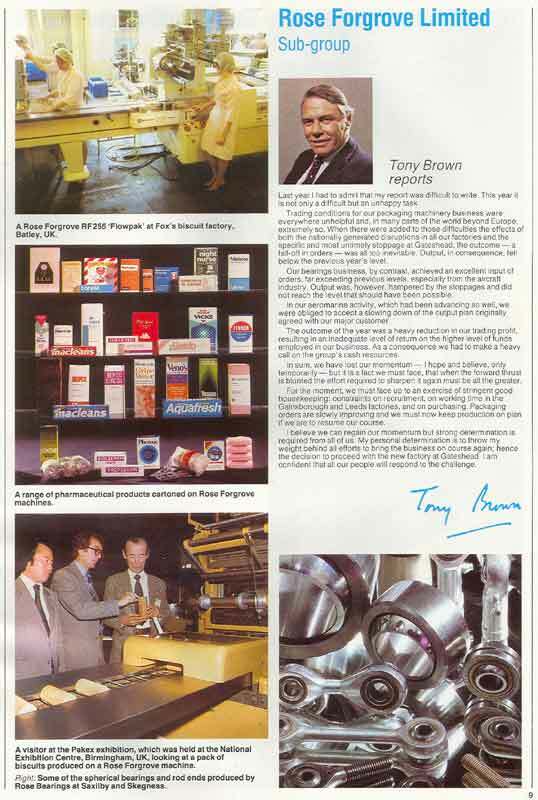 Five pages of colour photographs of group products were included for the first time in twelve years. 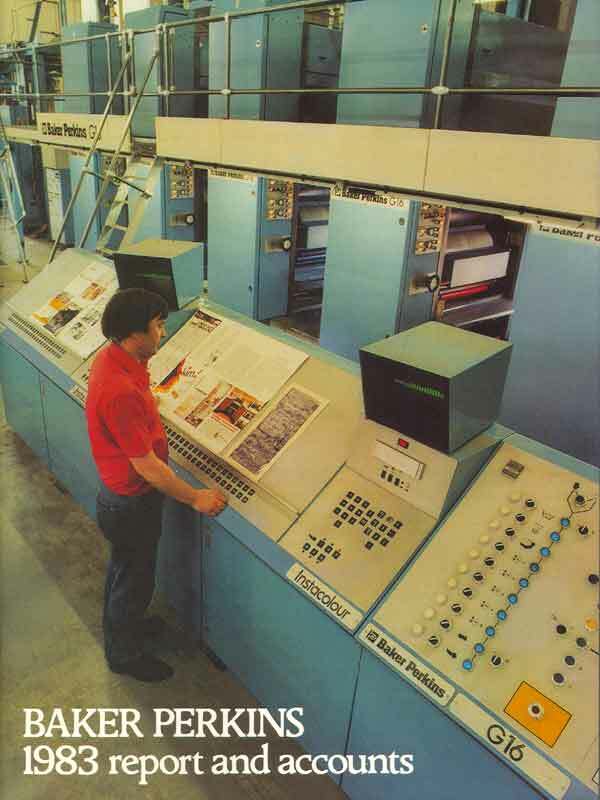 The front cover of the 1983 issue proclaimed to the City the growing success of the printing machinery business and this 'high-quality/high technology' image was repeated with a computer-controlled biscuit roll-engraving machine in 1984. 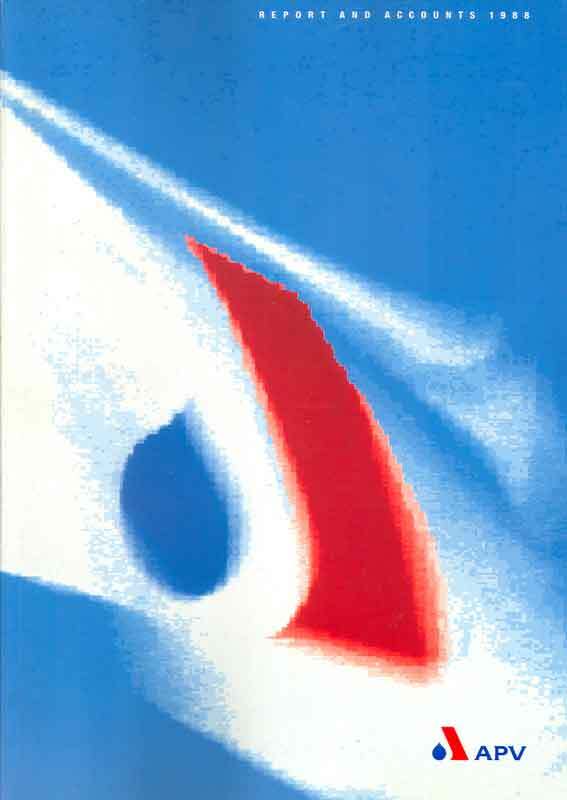 Rather more abstract designs were used for the 1985 and 1986 issues and it is interesting to note that colour photographs of the company's products had given way to colour photographs of the directors. 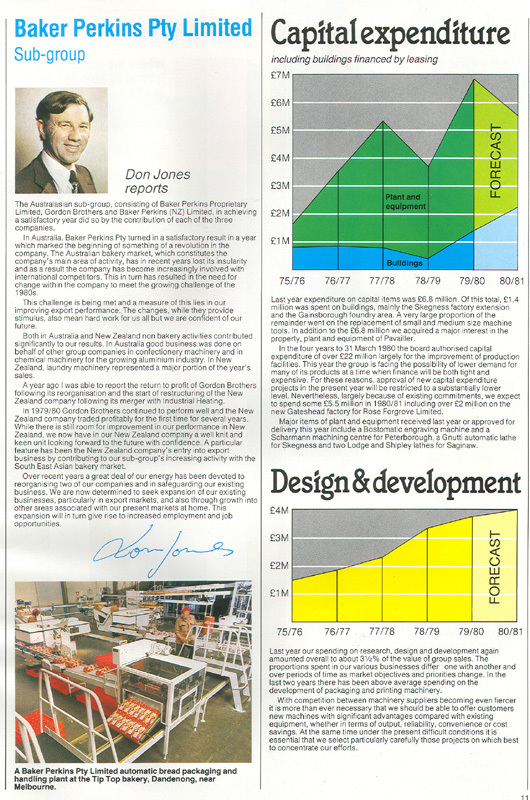 The Annual Report had been to a 32-page format since 1982, and 1986 – the year before the merger with APV - again saw the limited use of graphics, in the form of a series of bar charts showing the long-term trend in sales and profits. 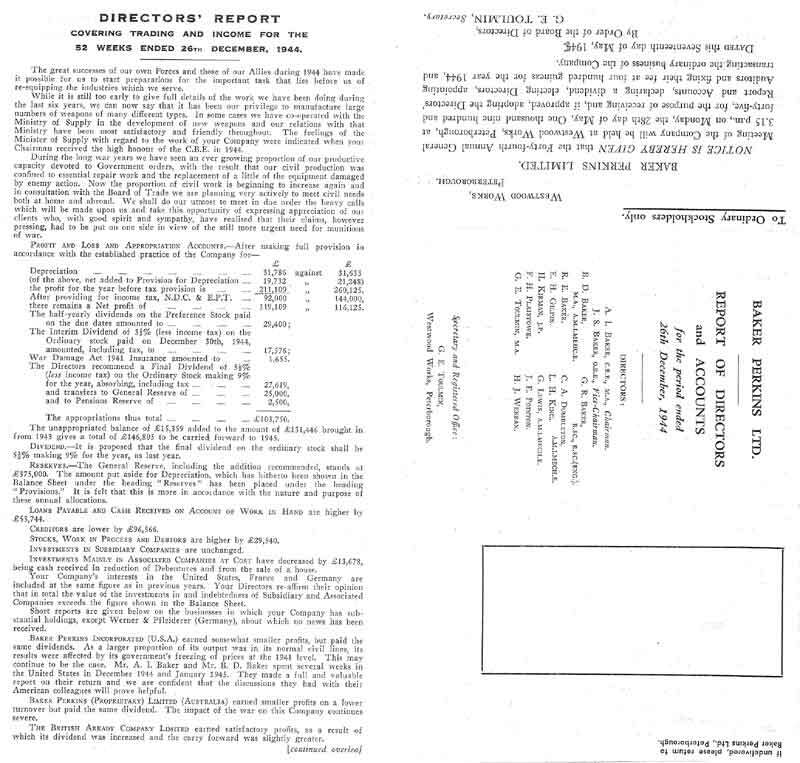 The Company Annual Report had come a long way since the 4-page summary of 1903. There was still, however, a consistency in the way in which the 'business message' was presented from year to year. As will be seen below, as the need to persuade the City of the coherence of the growth strategy for the new Group increased, this changed both in style and complexity in each succeeding issue. 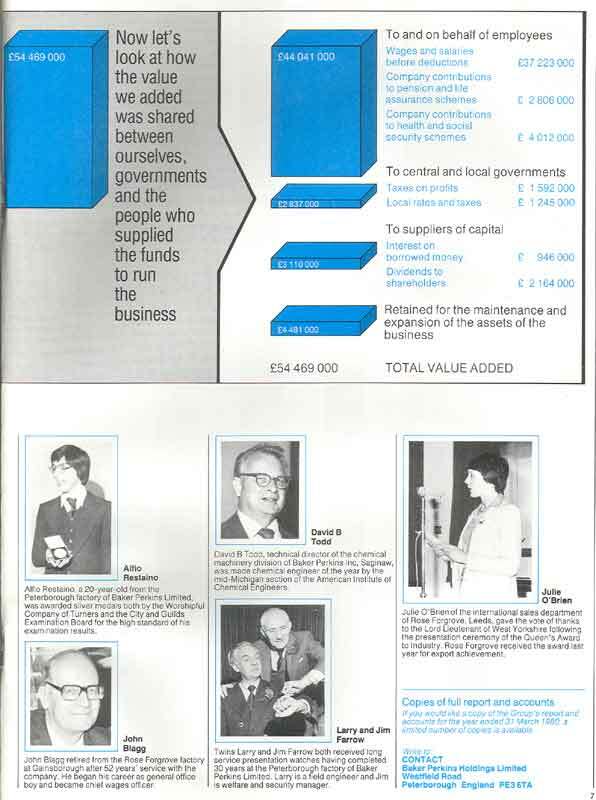 The merger with APV, Crawley in March 1987 brought further changes to the format of the Annual Report, perhaps with even more of a need to 'sell' the new company to the City, and it now extended to thirty-six pages. 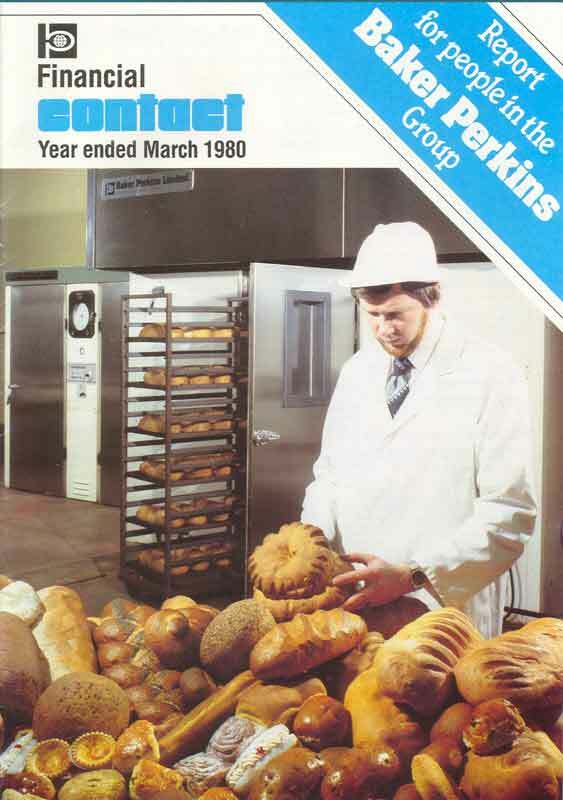 For a time, the new Group was called APV Baker plc but then, a major 'image' exercise was carried out resulting in new logos, etc., and by the time that the 1987 A/R was published the name had been changed to APV, APV Baker being reserved for the 'dry foods' business that was to be centred on Peterborough. 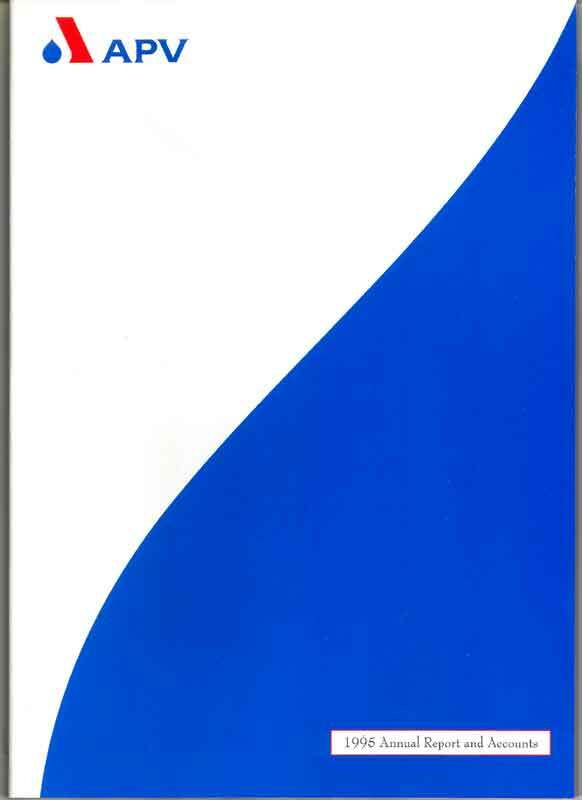 High-quality, glossy paper was used for the Chairman's and Directors' Reports, taking up half of the total number of pages, and these included a significant level of information about the new Group, its re-organisation and the markets served. Once again, colour photographs of machinery and end products were featured together with coloured photographs of the Directors. 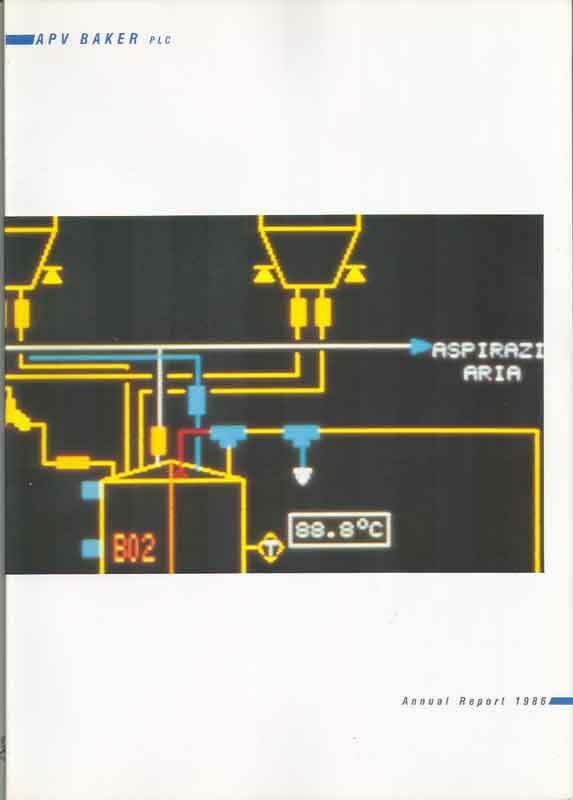 From 1986 to 1993 there was little consistency in the style of the front cover of the Annual Report. Featured prominently of course was the new 'A' logo but its treatment differed from issue to issue. 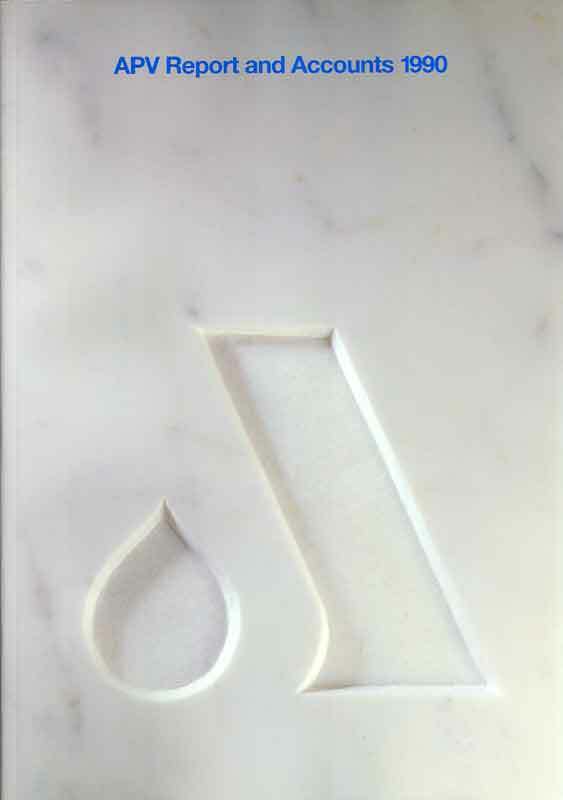 (See also Corporate Identity). 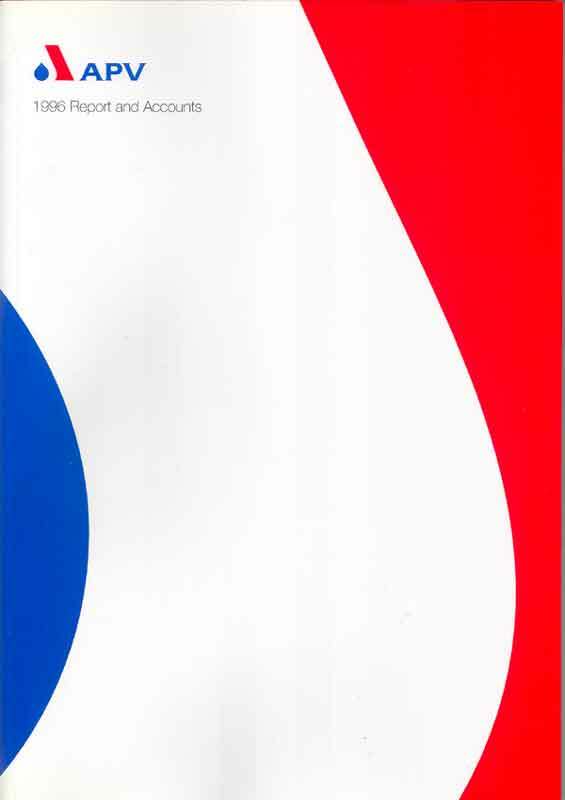 Pie charts and bar charts featured in the 1989 A/R and it had grown to 41 glossy pages. 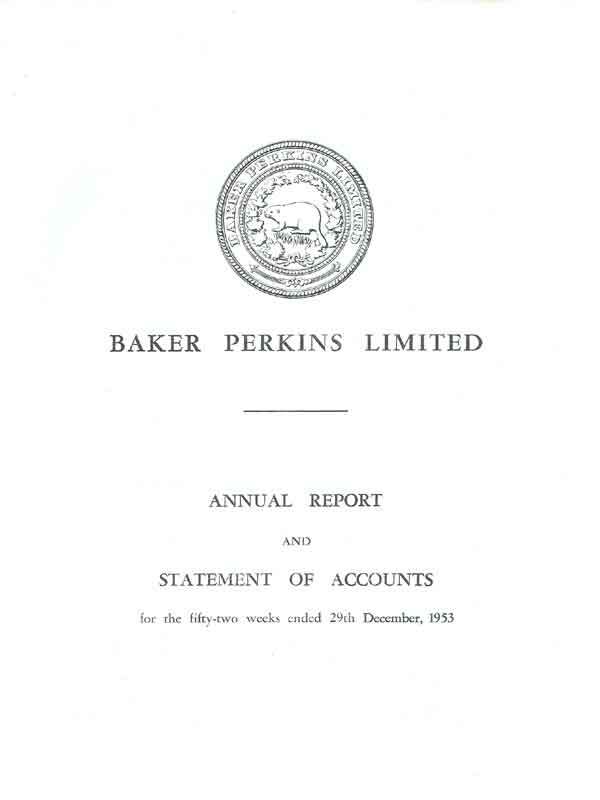 The Chairman's, Chief Executive's and Directors' Report took up 16 pages and the financial data ended, inevitably, with a Five Year Record showing the more than doubling of the Group's sales resulting from the strategic divestment and acquisition programme which continued after the merger with Baker Perkins. There was some use of high-quality photographs of end products to stress the wide range of markets served. 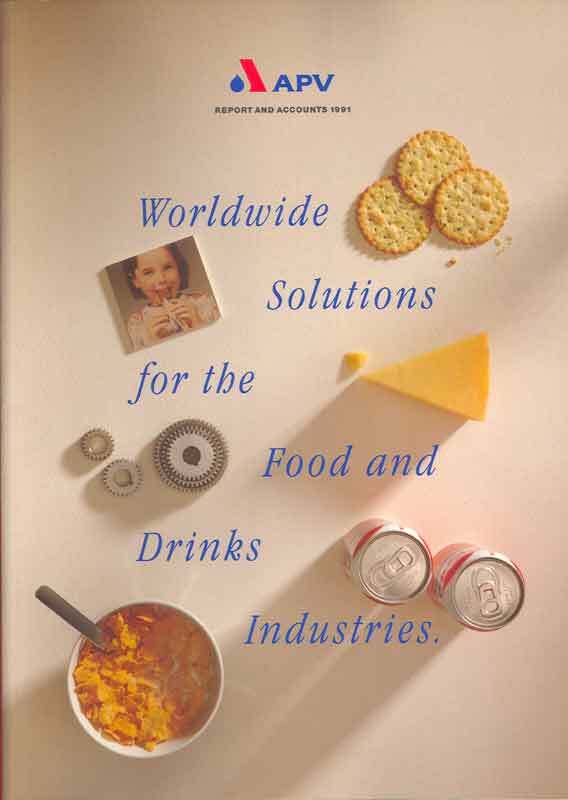 By 1991 the emphasis was on "Worldwide Solutions" and the A/R had four more pages to accommodate information about particular customers and recent orders. Graphics were still used to emphasise the key financial results and, within 22 pages of financial data, a "Ten Year Record" now appeared. The new Group was still working hard to justify itself to the City and a year later, with a new CEO on board, another approach was used to try to convince the City that a coherent growth strategy was in place. The Chief Executive's Review described the Company's activities in terms of "Expertise" – core competences; "Skills" – engineered solutions; "Network" – worldwide distribution and "Focus" – the markets served. The financial data was extended to 27 pages. 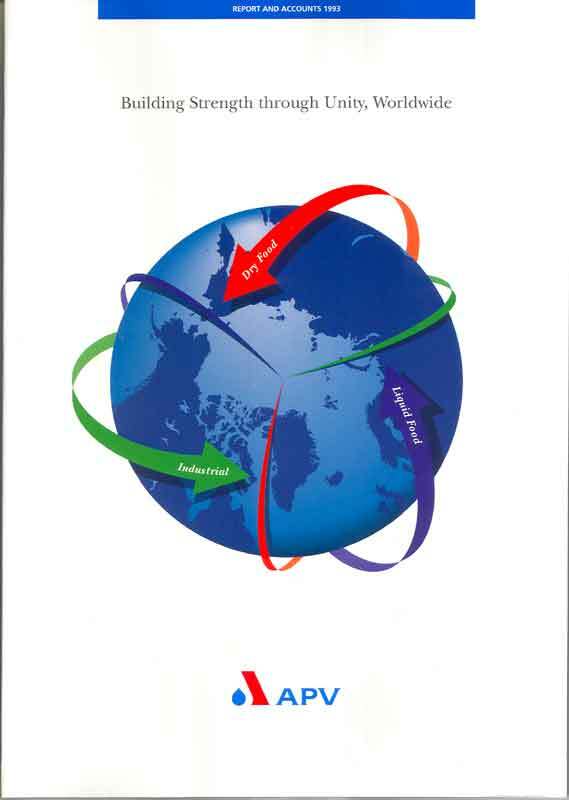 APV's Annual Report continued in a broadly similar style until 1996 but with the relative consistency of the front cover unmatched by a consistent internal message. The issues became fatter – from 1993 to 1996 it grew from 56 to 65 pages (50% words, 50% figures) – with each year featuring an entirely different approach to describing the organisation's core competences and strategies. In 1997 the long postponed takeover by Siebe – an engineering conglomerate whose first approach in 1986 could be said to have precipitated the merger between APV and Baker Perkins in 1987 – took place. By this time, Westwood Works had been closed for 5 years (See also The End).